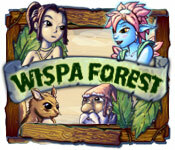 Wispa Forest is rated 3.1 out of 5 by 10. 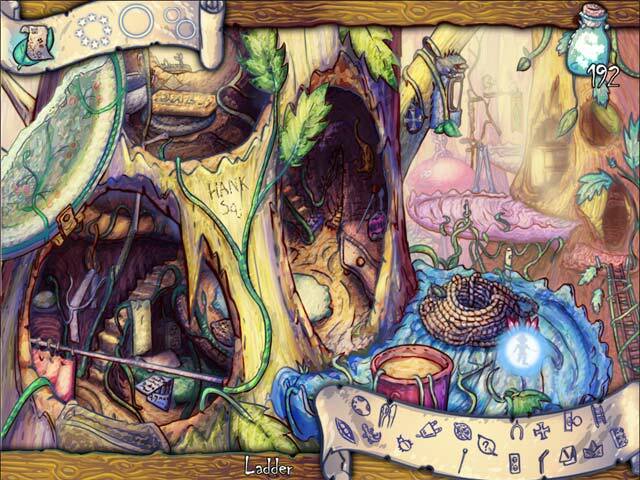 Rated 5 out of 5 by meme2222 from Very beautiful hidden object I just loved the artwork in this hidden object game. It was very challenging to find the objects but I didn't mind looking long over the artwork in which they were hidden. The colors were just beautiful and I liked the artists style. I just wish they had desktop wallpaper. The story was very engaging and I was looking forward to a good read. Unfortunately I was looking for a match 3 game but I will put it on my wish list when I'm in the mood for a challenging hidden object. I think it is a very unique game and is not to be confused with the run of the mill HO with all the puzzles and interactive role playing. This is more like a storybook with hidden object scenes, and is not for children because the objects are very integrated into the artwork. 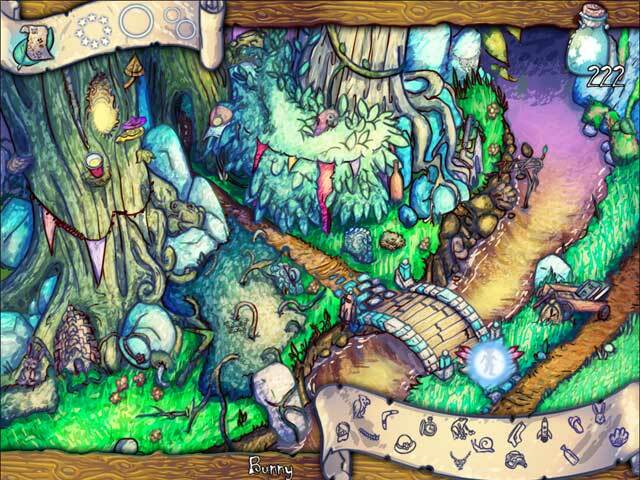 You will get to enjoy a story as it unfolds through the pictures and linger in the paintings as you test your hidden object skills. They will award you with stars as you complete each level depending on how many wrong choices so no random clicking if you are wise. Rated 5 out of 5 by aralia01 from Adult wanting a full HOG game not for children I'm trying this game because some of us adults want adult full hog games. Thank you for all of the negative reviews that assure me, and others like me, that this is exactly what we are looking for. Rated 5 out of 5 by Bullionist from Very good hidden object/match-3 game with nice atmosphere This was a very nice hidden object game with a pleasant atmosphere and several game-play features that made it more fun than many "standard" games in the same genre. The hand-drawn artwork is deliberately stylized, and very nicely drawn. There are cute characters and a nice map to travel from location to location as the story progresses. You have the assistance of a glowing forest wisp who flies around to collect the objects you click on in the hidden-object scenes. Completing tasks gets you mana, which you can use to cast spells that give hints. Spells that give more specific hints cost more mana. This feature made the usual hidden object search a lot more fun than games that just use the usual hint button that takes a fixed amount of time to re-charge. Because of the stylization of the artwork, many of the objects blend into the scenes which adds challenge. However this never became frustrating because of the mana-based hint system. Some levels also have a fun match-3 mini-game to play against an opponent, so the gameplay is not purely hidden object. The music also stood out as being very good, though often the music is silent and the scenes just have very nicely done ambient sound for the forest environments, which adds lots of atmosphere to the scenes. Rated 4 out of 5 by SYLPHEERA from For those HO players that want something different.... This game appealed to me in the screenshots because all the scenes are hand-drawn. In my opinion, the art style is like the kind you'd find in a teenager's school books. That's not a bad thing though. It definitely has a charm to it. The semi-manga style is something different to most HO games. This is for those who really like a challenge with the objects. Some of them were quite difficult to find. I usually try to avoid the 'hint' button, but with this game I used it many times. It's worth a try, I reckon. Rated 4 out of 5 by Deborlola from Different HOG I do enjoy hidden object games that are different. This is definitely one of them. It took a while to get into finding the objects but I thought is was very well done and kept me entertained for quite a while. I could go for a few more like this. Rated 2 out of 5 by llubavi from Poorly drawn, can't play This is an HO game but the drawings are so badly done that in most cases it is impossible to make out what they are and where they might be located. Sometimes I wonder if the developers truly believe their games are ok, or if they are just making fun of players while trying to make a buck on the side... Anyway, I deleted it after trying to play this joke for 15 minutes. Rated 2 out of 5 by Squidipuss from Disappointed I was hoping for a fun search & find, but instead found frustration. The graphics are cute (which is fine with me), reminding me of the artistry of one of my favorite games, Hodgepodge Hollow. Unfortunately, the similarity stops there. The Hodgepodge Hollow scenes are crisp and full of wonderful details. Here the lack of clear drawing is a major problem. The 'list' of objects to find is composed of drawings of the actual objects, not just outlines. Hovering over the drawing brings up the name of the object, such as 'boomerang.' And good thing the names appear, because many of the objects are unrecognizable (the gumdrop, for example). In the scenes there are two problems, seemingly opposing, so bear with me. First, many of the objects are very difficult to see in the scene (the gumdrop, the lizard). On the other hand, other objects are so obvious that I played two rounds without looking at the HOS drawings or words for about half the objects (the lady's hat, the Lego block). There's also a match 3 game as part of this, which was pretty good, The instructions for it were a bit too long and detailed, but would probably help if you'd never played a match 3 game before. A few notes about how I play games: I don't turn the sound on, so I can't comment on it. And I play on my Lenovo Flex which has a tablet-sized screen. Rated 2 out of 5 by mrm2006 from Awful Game. The story line just went on and on and on. Too much reading. Some voice overs would have helped because you spend so much time reading all these scrolling lines, you can't enjoy the graphics. The graphics were grainy and cartoonlike, although I think that was the point as this is supposed to be a "fairy land" called Underwood. The sound was annoying. The gist of the game is to play HOGs (hidden object games). But the items you have to find are tiny silhouettes and the scene in which you have to find them is impossible. There isn't a word in the dictionary to describe how absolute teeny, teensie, tiny these items were and they blend into the surroundings so incredibly well, it's impossible to find anything without using the "click and hope" method. Then, when you finish the level, you get a reckoning of how many "misses" you had. Nice. Periodically, you had to play a series of 3 match 3 games. These were the best part of the game and went all to quickly. Even here, you could barely tell which boxes needed to be destroyed to pass the game. This is a definite NO PURCHASE for me nor will I recommend it as it is an impossible game to play. Rated 1 out of 5 by Hookedonbigfish from Only deserves a whisper Not a very encouraging game. Hand drawn scenes very undistinctive hidden oblects. Looks more like a childs kindergarten project rather than a professionally orchestrated game from Big Fish. 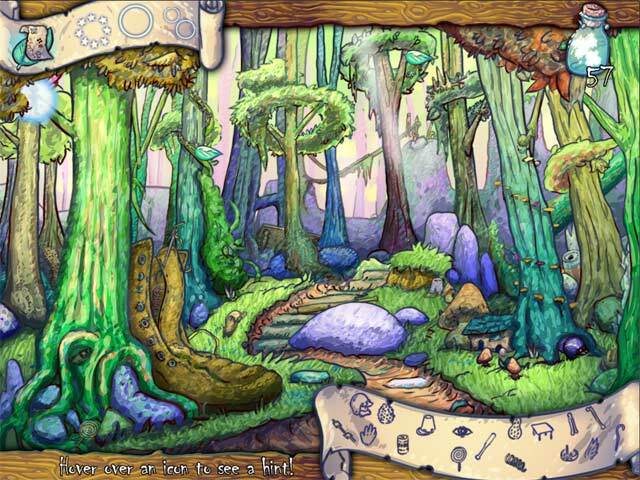 This game, although child like with fairies etc is way too difficult for a child to identify or percieve the hidden objects and that is about all this game is. Not for me, I wouldn't waste my money on it. Rated 1 out of 5 by Rescue_helo from A HOG and nothing but a HOG which is best avoided Judging by the artwork and the fairy tale story, I thought at first Wispa would be ideal for children, especially the younger ones as an introduction to casual games. Alas, alas, alas, Wispa Forest is much too difficult for them to start with, and it is made exclusively of HO Scenes and nothing else. The sceneries are hand-drawn but their style is neither convivial nor suggestive of a dream-like land. They are more like a kid's doodle than the work of professionals and lack details as well as sophistication. Same remark regarding the colors, the combination of which is not really a happy one although they're relatively bright; the choice of palette turns monotonously around always the same pastel hues without any truly crisp contrast. The difficulty resides in the hidden objects; not only are many of them poorly silhouetted but they blend so well into the background that it's virtually impossible to locate them. You earn mana points each time you find an object, which you can spend on three types of hints to spot the unspottable. The overall impresion I got was that it had been thrown together in a hurry. The result is dull, unimaginative, unchallenging, unexciting. Aside the fact that the characters are very cute, this game has nothing to offer to our progeny -or anyone for that matter- save a great deal of intense eye-straining and infinite boredom. Help a Wispa, Lyia, save her magical world from a wave of corruption that is decimating the land in this fun Hidden Object game!